Hollywood has a real knack for the good idea - if you've had it, chances are someone else has too. And it can't be intellectual property theft or anything, because it's a well known fact that if someone has thought of a brilliant idea, someone else will think of exactly the same thing at almost exactly the same time. Take a film about terrorists wanting to take down The White House. What a brilliant idea! And there's no way a film called, say, White House Down, could be confused with another film about a bunch of terrorists trying to take down the White House - because that was months ago now. And had Olympus in the title. 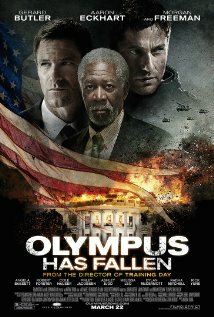 Now, I will admit I haven't seen Olympus Has Fallen yet (I'll be doing that just as soon as I've written this. If the writing slows down towards the end, you'll know why) - but if it's even half as barn-stormingly stupid as White House Down, it won't be a disappointment. Because, and I think I can say this without fear of contradiction, White House Down has to be the dumbest, most stupid, ridiculous, laughable, stupid dumb film I've seen this year. A year that saw Die Hard 5 and Red Dawn trouble our screens. And amazingly, that's not a criticism. Yes, it's stupider than a film written by Stupid Tom Stupid, mayor of Stupidville who has written a special film celebrating Stupidville for the Stupidville Film Festival.... But it's fun. Not necessarily in a good way, sure, but it's an enjoyable kind of dumb. There's an honesty to the brainlessness. It is trying to be a good, solid, big bad action film. It really is. It's trying ever so hard. It just left its brains at home. The plot is quite a complex one, though, so I'll try and keep it simple. A man taking his daughter to his job interview at the White House doesn't get the job but instead gets caught up in an attempt to start World War III and has to save the day, daughter and president. Not necessarily in that order. Change of plan - I've got fruit juice. Right, on board? Up to speed? Pretty sure you know what's going on? Excellent. Let's continue. The star of this whole shebang is the one and only Channing Tatum, playing the self-same aspirational loser deemed not good enough for the secret service. Sure, he's been cleared to guard the Speaker of the House Of Representatives, but that's nothing, right? Handy for the plot though. Now, you might be thinking - upon hearing tell of a man with an ex-wife, family issues and a questionable attitude taking on a small army single-handedly - of a little known film franchise called Die Hard. 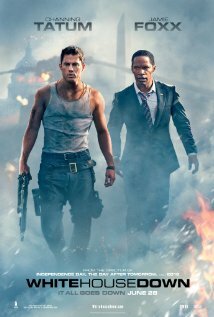 Fortunately, the producers of White House Down thought of this, so they didn't add to the stupid by calling Tatum's character John and having him tear-arsing about in a vest for the whole of the second half of the film. 'Cos that would have been stupid. And comparisons with John McClane's Die Hard never ending franchise don't end there. We have bombs, planes, guns, rocket launchers, men in a lift, more bombs, extra guns, helicopters, tanks, hand grenades, another bomb, a car chase around the White House lawns and a nuclear submarine. And an odd collection of people who have vaguely Eastern European accents for no real reason. It's got the lot - with bombs on. The really baffling thing with White House Down, though, is the cast. We've got Jamie Foxx as President, Maggie Gyllenhaal as the deputy boss of the secret service, James Woods as the actual boss, Richard Jenkins as Mr Speaker, Michael Murphy as the Vice President - these people can act. And Channing Tatum's in it too. Clearly the makers of White House Down had dreams of a serious, heavy-hitting actioner. There's even some ridiculous plot points suggesting aspirations of political messaging (the President wants peace in the middle east, others don't), dialogue that is meant to be both meaningful and stirring - it's obvious no one set out to make White House Dumb. ...and my personal favourite, Jason Clarke's baddy Stenz - upon being offered cake - snarling "no I don't want cake, I'm diabetic". Something which is NEVER REFERRED TO EVER AGAIN. That someone thought that line important enough - presumably it tells us something deep and personal about Mr McShooty-Shouty - to keep it in the final edit is simply a thing of beauty. So why didn't I hate this? By rights, I should have been swearing at the screen from five minutes in. But I wasn't. I was laughing. Not because of al the sharp one-liner zingers (fat chance) but because it's so stupid, hating it would be like hating your dog for not learning to fetch or sit. He is trying, really trying, but he was short changed in the brain department and he thinks standing there grinning and wagging his tail is the same thing. And you can't hate that. You should. You should be annoyed by how laboured the dialogue is, how leaden and obvious the plot, that the twists can be seen coming over the hill with a full marching band and cheerleaders, the laughingly bad special effects, how one man can be beaten to within an inch of his life and still come out on top (who said John McClane? ), the obvious plot points (watch for the watch), the diabetes - all of these things should make you get up, throw your popcorn at the screen, and head to the pub. But, like Die Hard 5 and Red Dawn before it, it's strangely hypnotic and enjoyable. In fact, it's the stupid that makes the film what it is. OOOOHHHH, before I do that - the new Fish album, A Feast Of Consequences, is nothing short of bloody brilliant. Arguably his best solo album yet, which is some claim given his output over the past 20-odd years. Stunning stuff. Especially All Loved Up and Blind To The Beautiful. Wonderful. Right, well, I'll be honest - Olympus Has Fallen wasn't as bad as I feared, although I could have pretty much watched the trailer and saved two hours of my life. Where OHF (but I am consistent) does dare to differ from WHD is clear and crucial - for a start it has Gerard Butler in it, not Mr Tatum. This is a bad thing, because Butler's American accent is shonky and his acting is worse. Also, and don't be fooled by the poster here, you might think Morgan Freeman is the main man, but he isn't. It's Aaron Eckhart. This is also a bad thing. First, Eckhart (a man I've been a huge fan of since Frasier and Thank You For Smoking) is unconvincing. It's as much a script issue as performance, but as President he's not up to snuff. Second, Freeman might make a better president but he's sleepwalking through the whole thing. He looked as bored as I felt. OHF is also a lot more violent. It's clear that was the plan from the off. It's darker visually, and then the blood starts splattering the walls and the body count starts to rival a Rambo film. This is not a good thing. The violence is over-the-top gory, and at one point even a dog cops it. And there is really no need for that. I don't care how you film it, it's a scene that has no place in this movie. We have how brutal the enemy is rammed down our throats, we do not need it rammed further. It's horrible and unnecessary and director Antoine Fuqua (he also made King Arthur - how is he getting work?) should be ashamed of himself. You'll also spot the villain coming a mile away, even if you haven't seen the trailer. Seen Die Another Day? Yeah, it's him. Amazingly, I didn't hate this film (that scene aside), but it really is bad. The effects are cheap, the characters are paper thin, there are captions all over the place to save the writers the bother of doing dialogue (something they seemed to manage in WHD), the guns are LOUD but the talkage is quiet, the plot devices come with a set of cheerleaders and brass band, the score is awful and the 'news footage' is basically the same as WHD. The ending is also enough to make you shove your foot through the TV. Thought the nationalistic zeal of Independence Day was OTT? Ha, it's got nothing on the mawkish attempt to elicit emotion here. Oh, and keep an eye out for the flag. It'll bring a tear to your eye. If you see just one film about terrorists taking over the White House and blowing it to bits, make it WHD. If you must. I liked Olympus a little better than White House Down, however, when all is said and done, they're both very stupid, and also fun. That's all there is to it. Good review Kahn. Cheers! Definitely the other way round for me. Olympus takes itself far too seriously - like being hit over the head by a brick wrapped in the American flag - while WHD has a more knowing glint in it's eye. I also really struggle with Butler on screen.